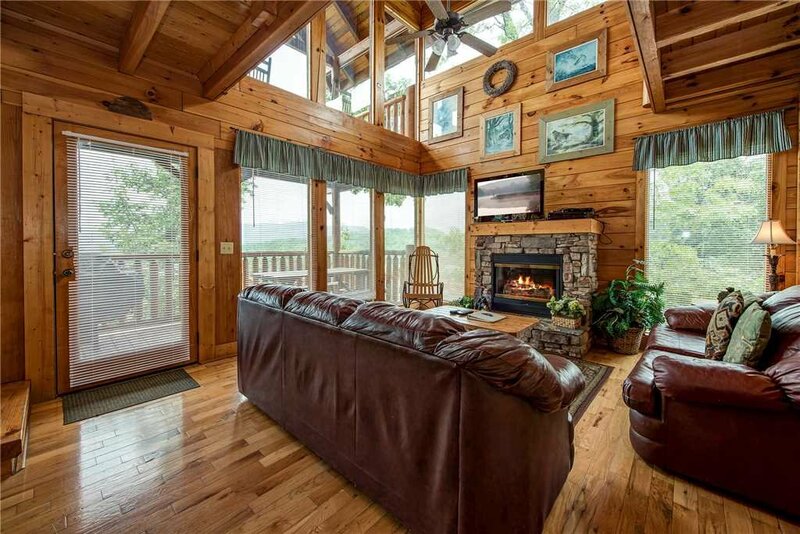 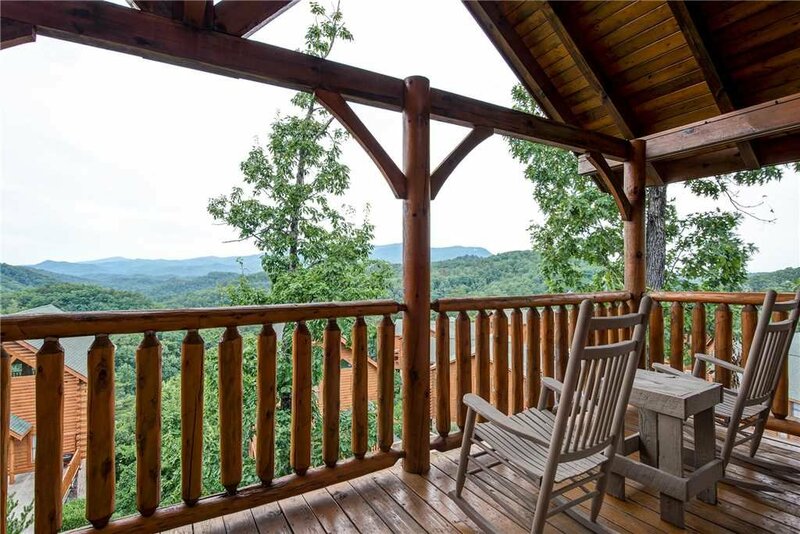 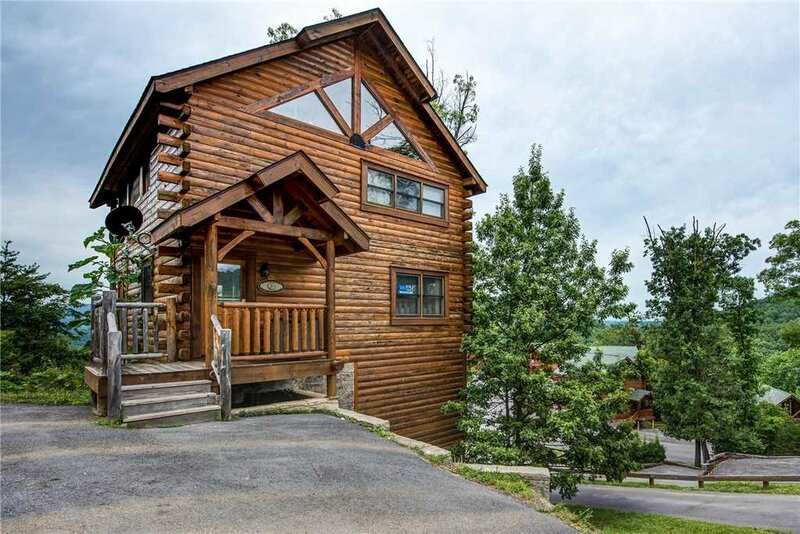 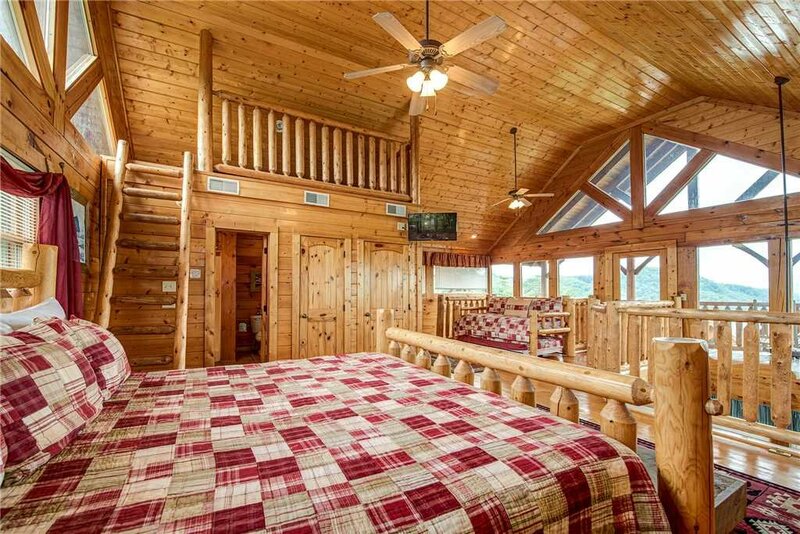 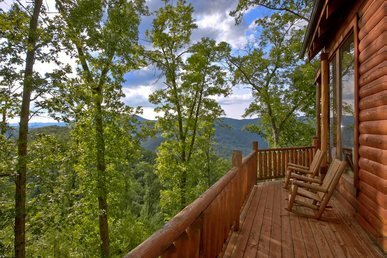 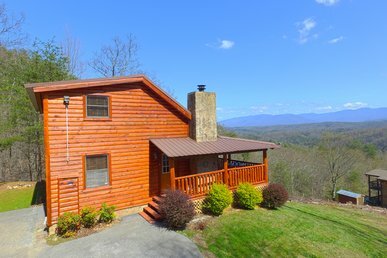 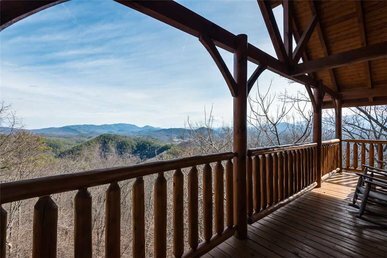 A 3-story log home that can sleep up to 16 people, Mountain Seduction has everything you need for a fun, relaxing vacation: beautiful views, proximity to local attractions, and amenities including a hot tub, a pool table, and foosball. 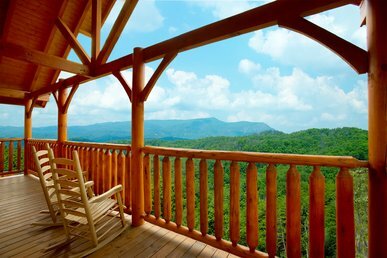 Mountain Seduction’s 3 decks look out over the trees toward the Great Smoky Mountains. 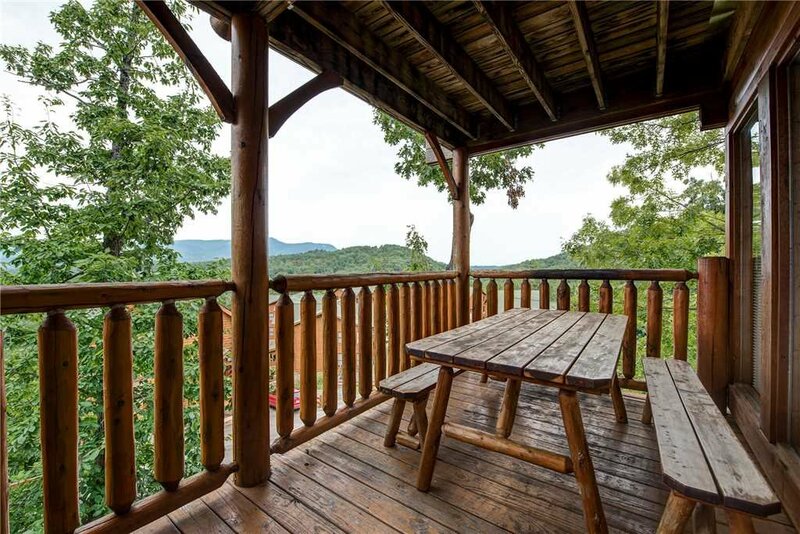 You can enjoy the views from deck rockers, a swing, or a large picnic table. 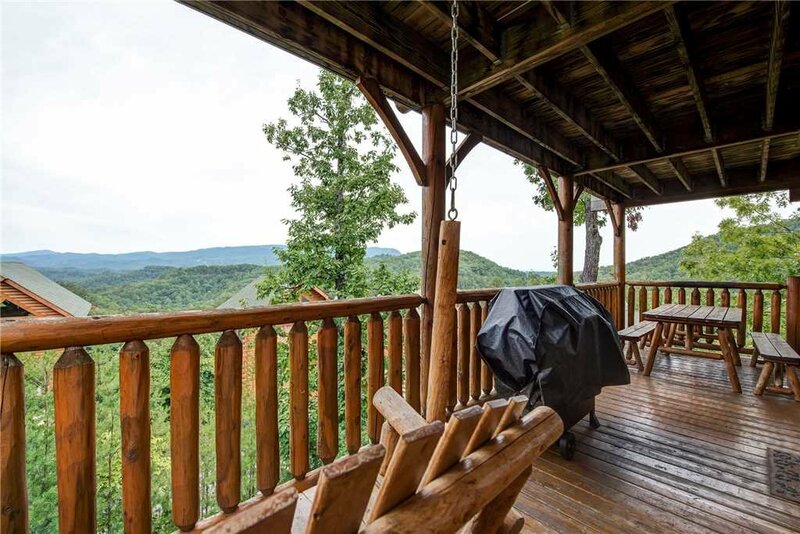 Weather permitting, you might want to eat all your meals on the deck: The singing of wrens and warblers is the perfect background music, and the crisp mountain air makes even peanut-butter sandwiches taste special. 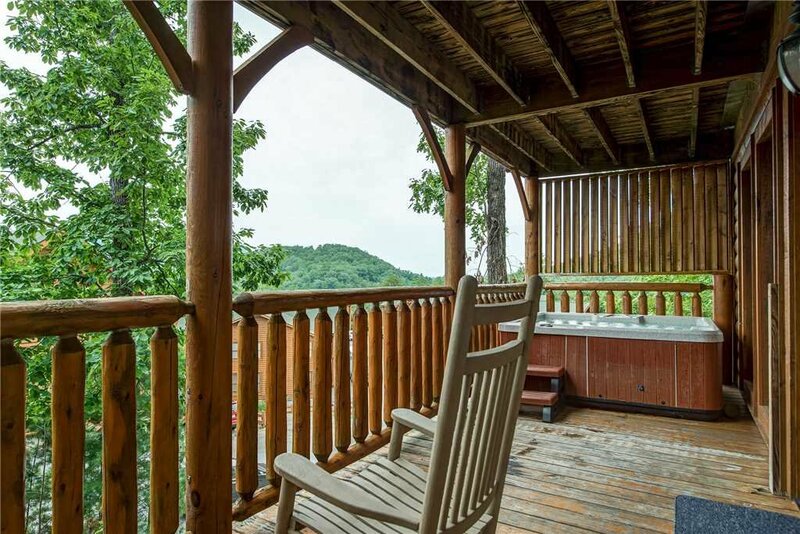 The most luxurious way to savor the view, however, is probably while soaking in the deck’s hot tub. 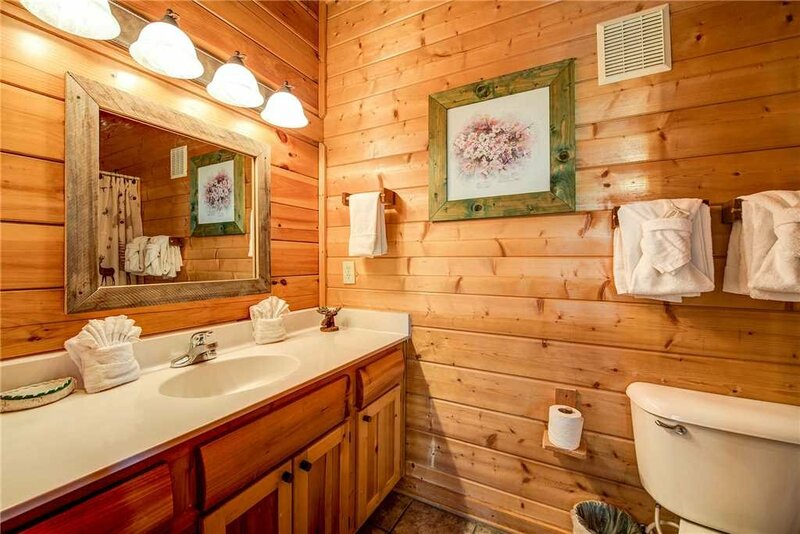 It’s especially romantic at night, in the silvery sheen of the moonlight. 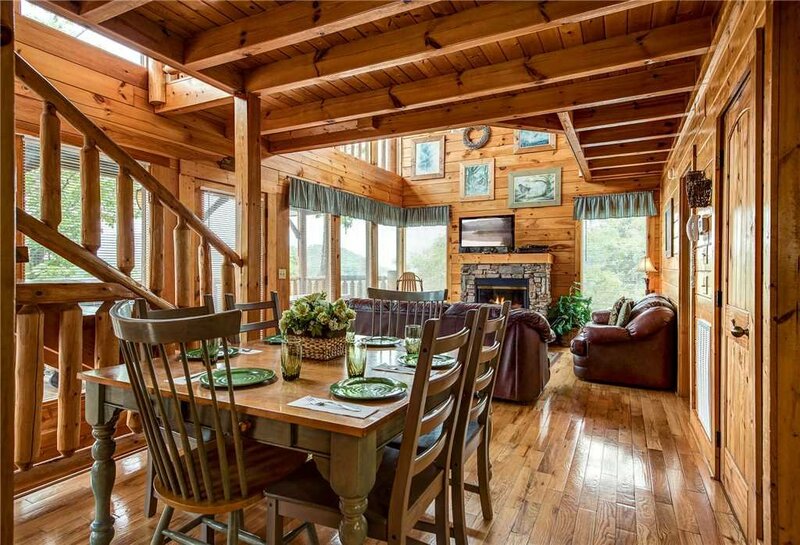 You can relish the views indoors too, thanks to the large windows of the main floor’s great room. 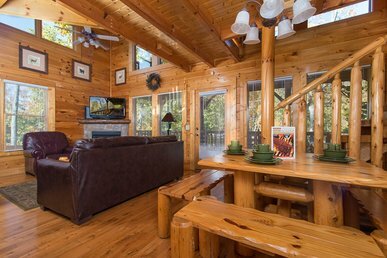 In summer the fan that hangs from the cathedral ceiling will add a gentle breeze; in winter the warm glow of the stone-surround fireplace adds to the warm ambience of the wood-planked walls and floor, the comfortable leather couches, and the rustic yet refined decor. 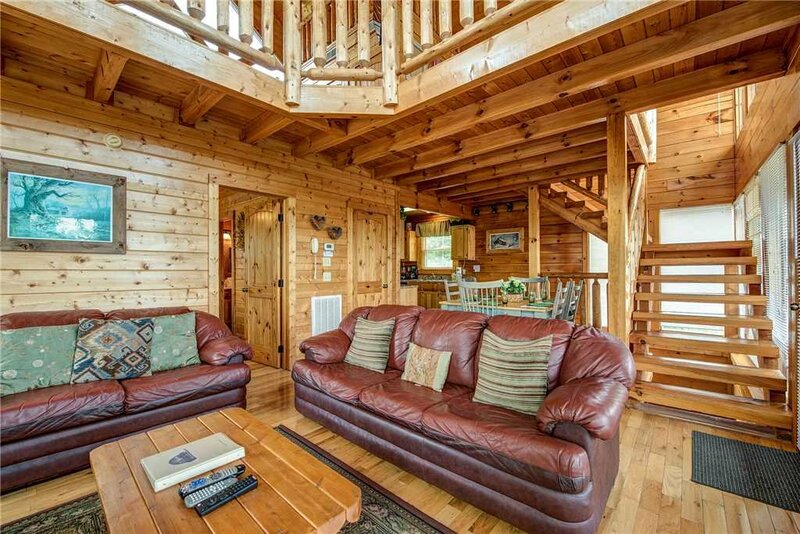 This is a wonderful space for watching a cable movie on the HDTV, surfing the web via the free WiFi, or playing charades with family and friends. 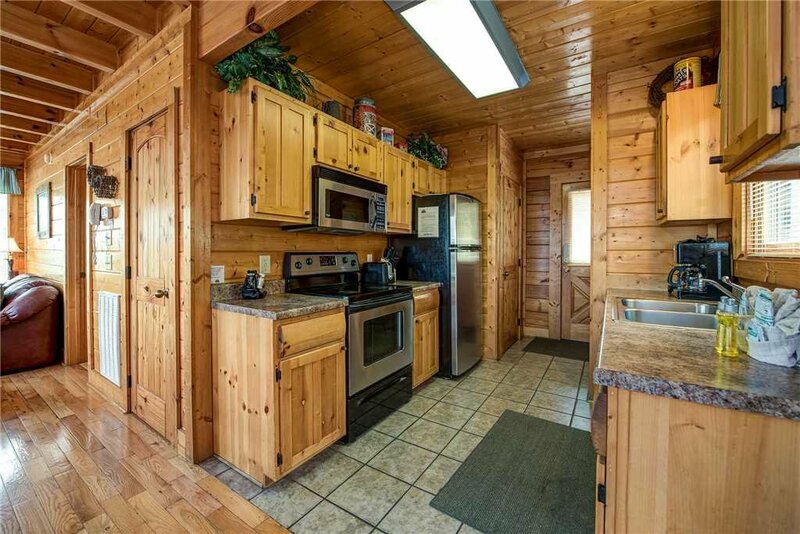 Also on the main floor is the kitchen, which is equipped with stainless-steel appliances, gleaming countertops, and plenty of cookware and tableware. 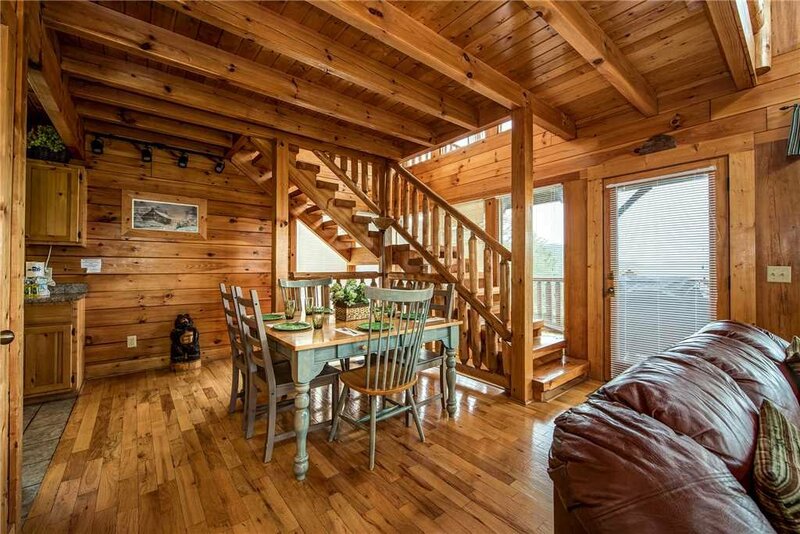 When you’re not eating out on the deck, you can settle in at the dining table, which easily seats 6. 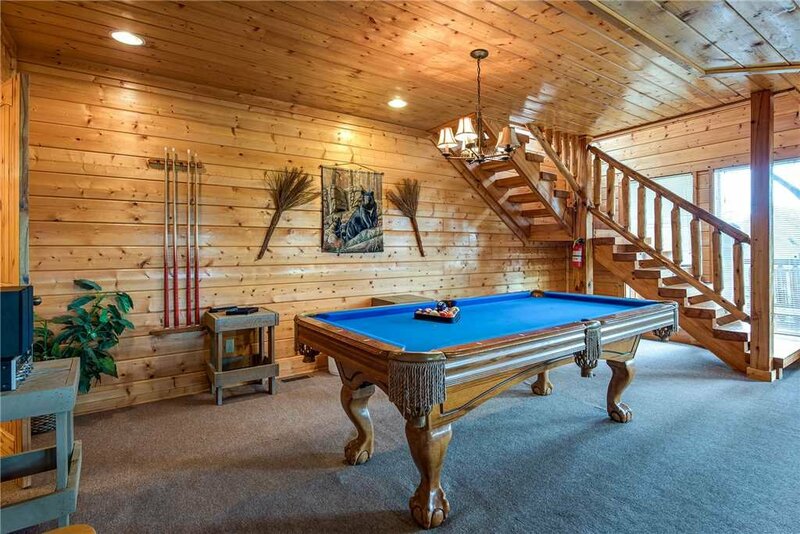 If you’re wondering where everyone disappeared to, check the downstairs game room. 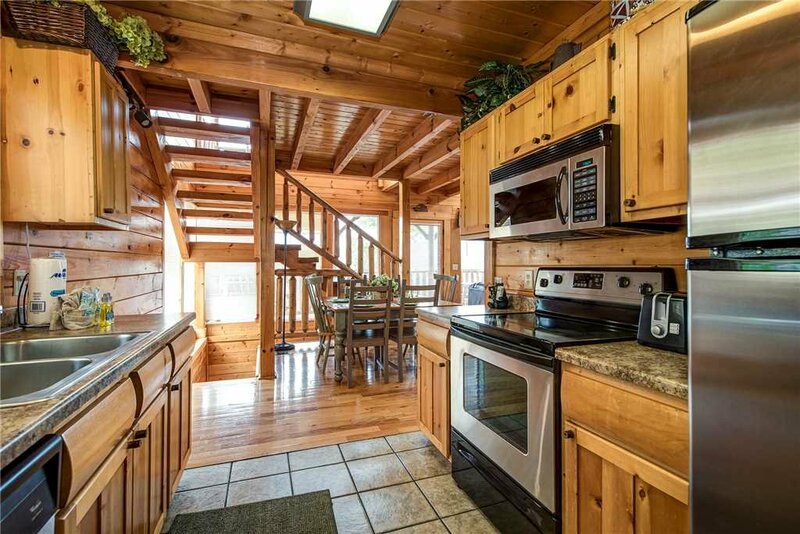 Not only does it provide plenty of space for the whole gang to gather, but it offers plenty for everyone to do as well. 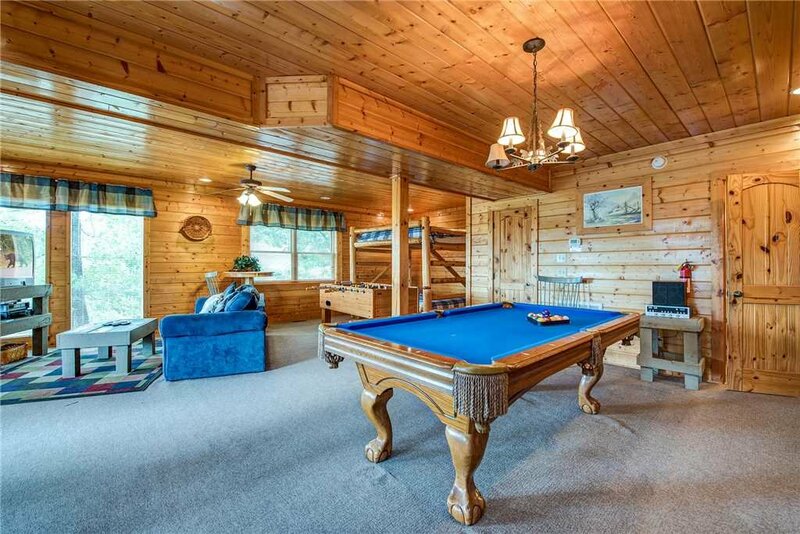 You can shoot pool at the full-size billiard table, play foosball, kick back on the plush sofa to watch TV, or have a go at the PlayStation 2. 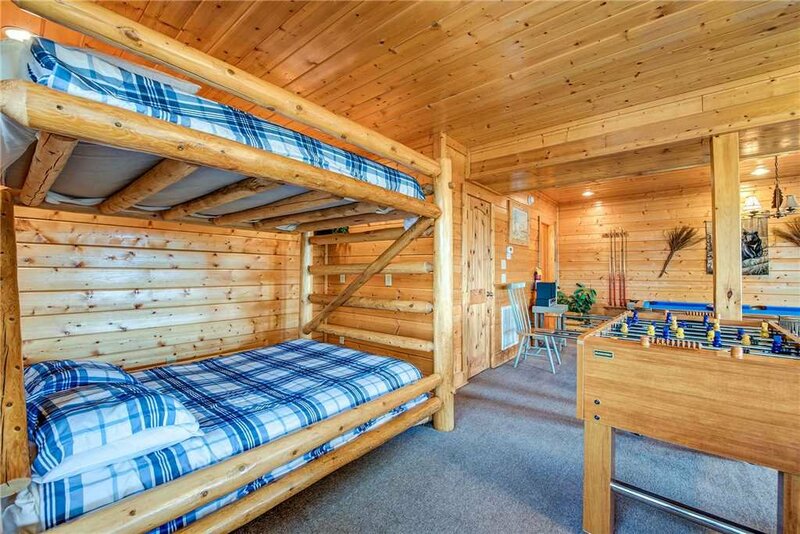 The game room also has bunk beds, making it a bedroom as well. 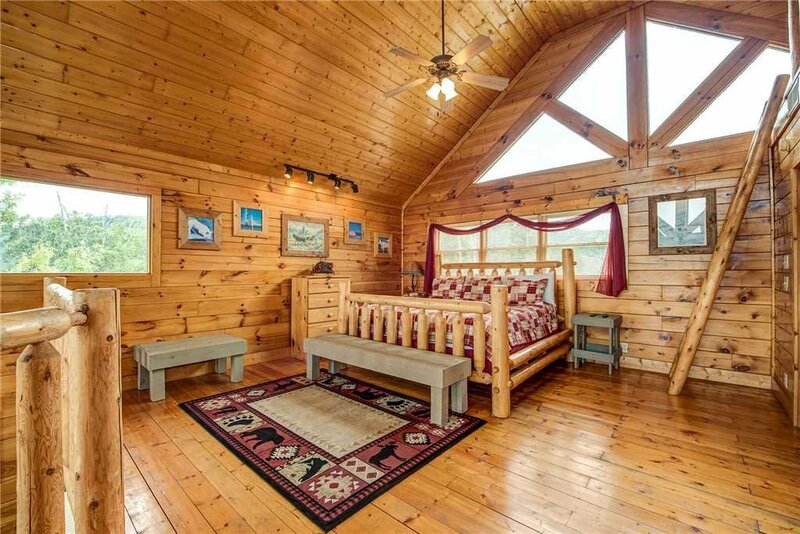 It won’t take much convincing for the kids to make this their bedroom—though we know plenty of adults who would love to sleep here as well! 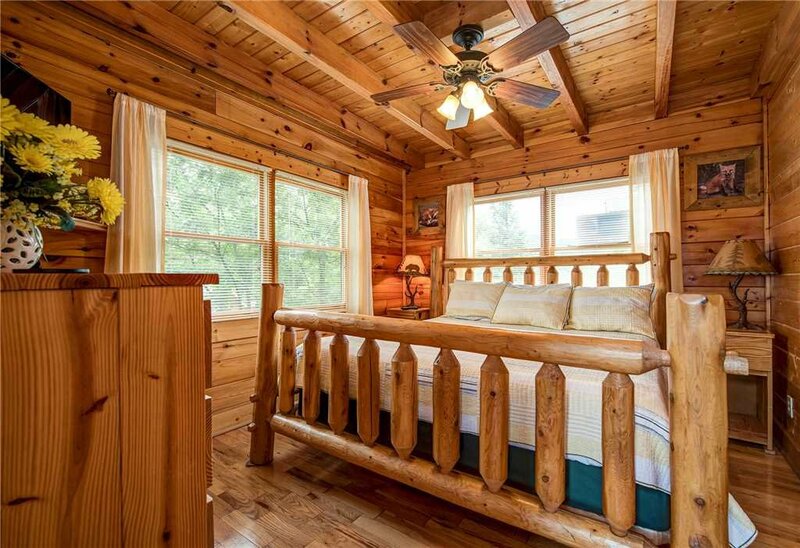 Of the 2 “official” bedrooms, one is on the main floor and the other makes up the loft level. 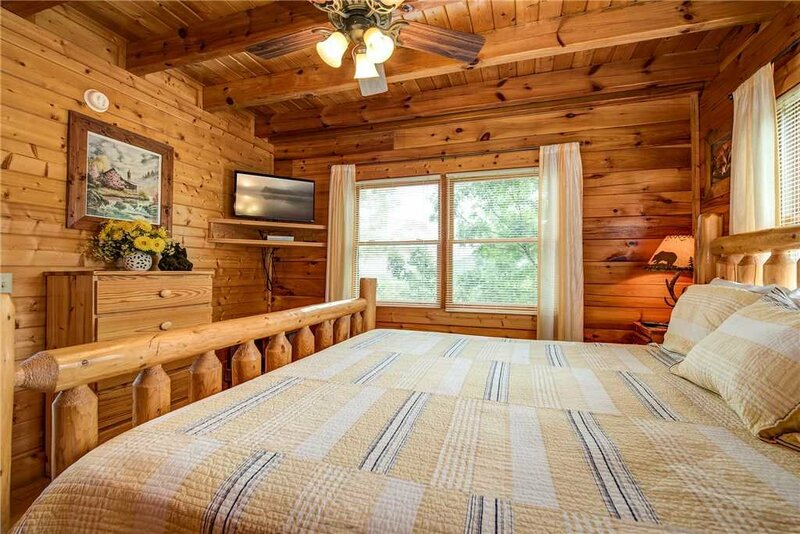 Each includes a log-frame king-size bed, a TV, and a ceiling fan. 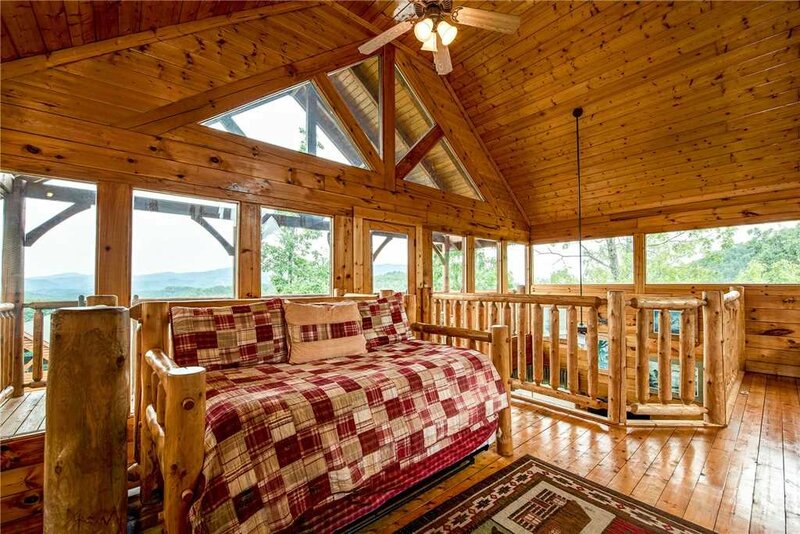 The loft has a sitting area as well, with a trundle daybed that can sleep 2 more people. 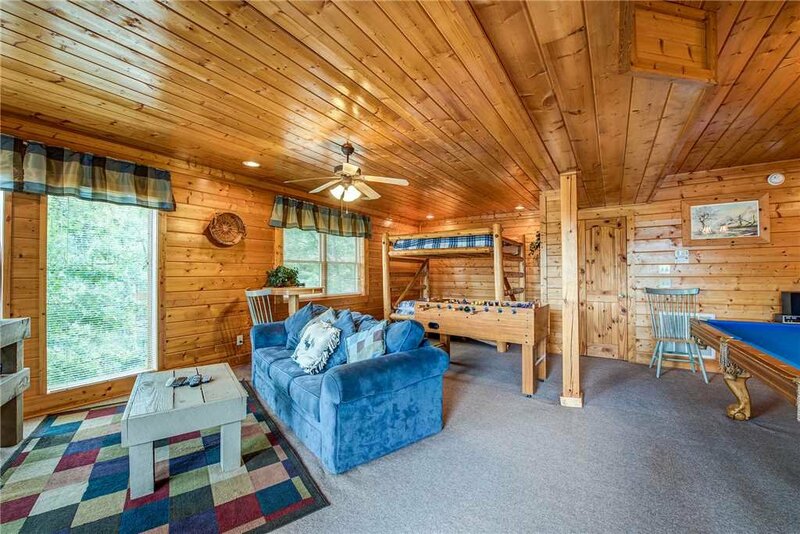 Two futons and 2 sofa beds throughout the 3 floors can sleep another 8 guests as well. 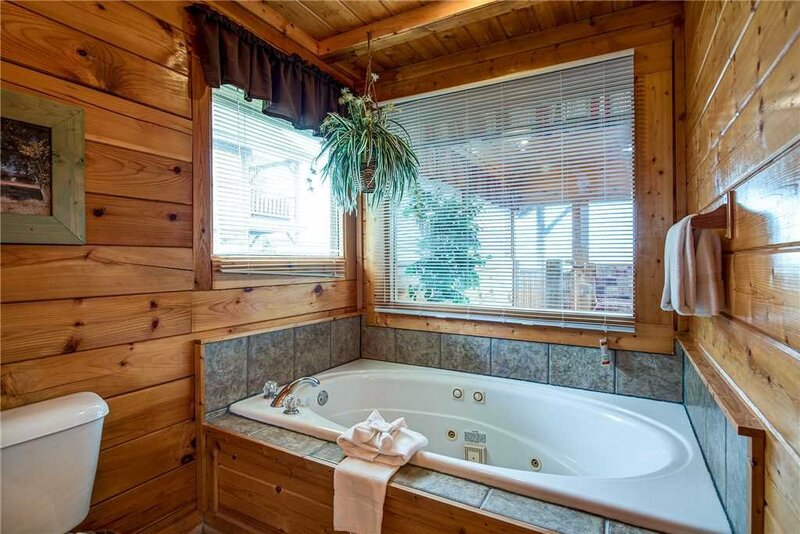 Each floor has its own full bathroom, and the loft bathroom has a bonus: a jetted tub. 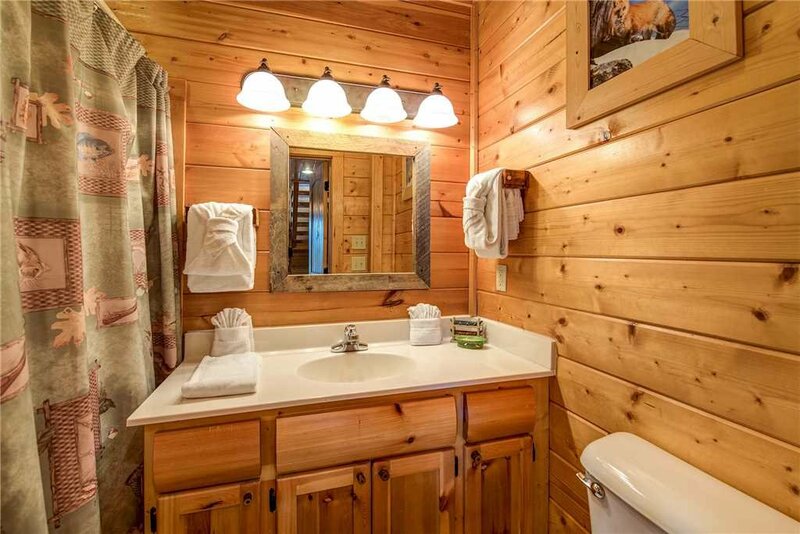 After a day of hiking, horseback riding, or chasing the kids throughout Dollywood, a long, lazy soak is just what your weary muscles will need. 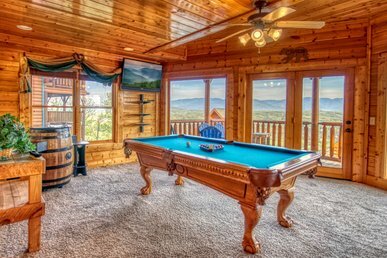 Mountain Seduction’s other amenities include a washer and dryer, so you can pack lighter than usual. 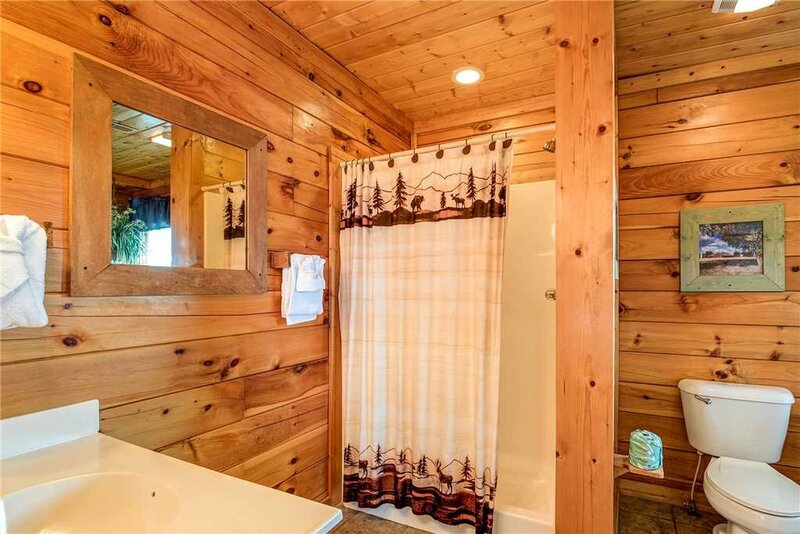 Be sure to bring your swimsuit if you’re visiting in the summer, though. 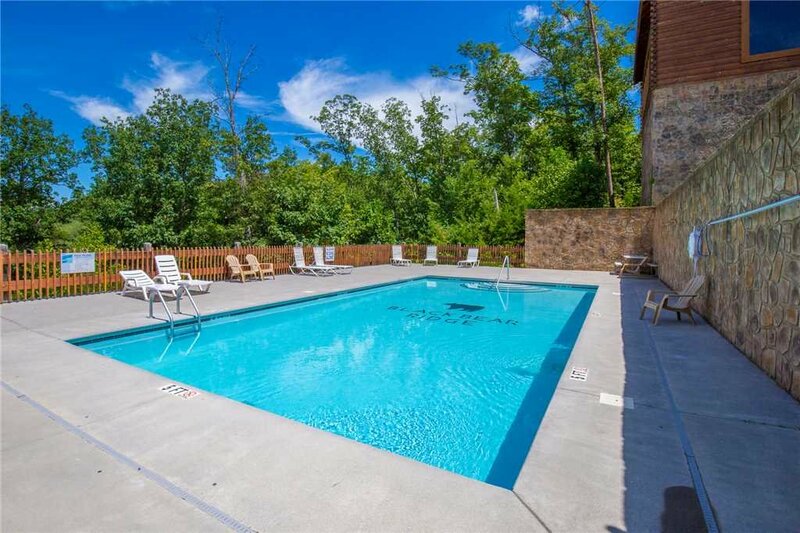 Mountain Seduction is located in the Black Bear Ridge Resort, which has a seasonal outdoor pool and a large poolside patio for lounging in the sun afterward. 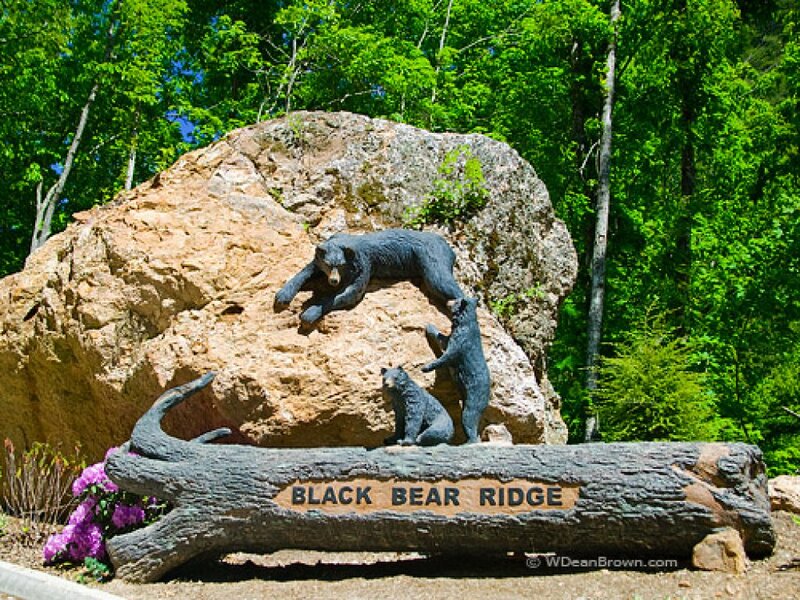 Another advantage of Black Bear Ridge Resort is its convenient location. 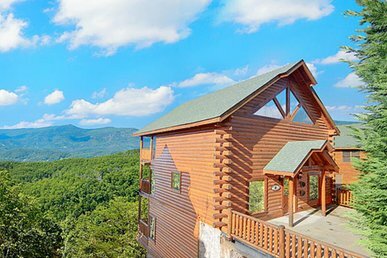 In less than 10 minutes you can drive from Mountain Seduction to 2 alpine coaster rides; 10 minutes will take you to Pigeon Forge Parkway, home to the Titanic Museum, WonderWorks educational amusement park, dinner theaters, go-kart tracks, and more. 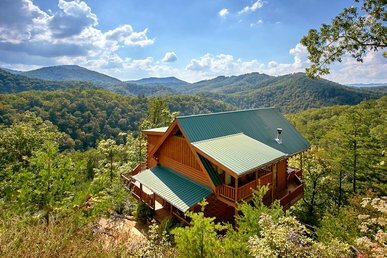 The wildlife, wildflowers, and waterfalls of the Great Smoky Mountains National Park are less than 20 minutes away, and Dollywood is just a bit farther. 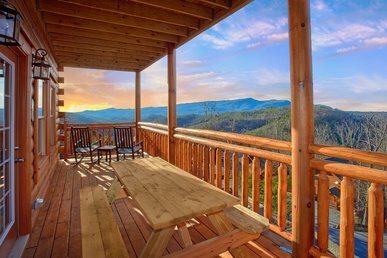 When you stay at Mountain Seduction, you can do it all—and that includes kicking back on the deck with a frosty drink doing nothing at all. 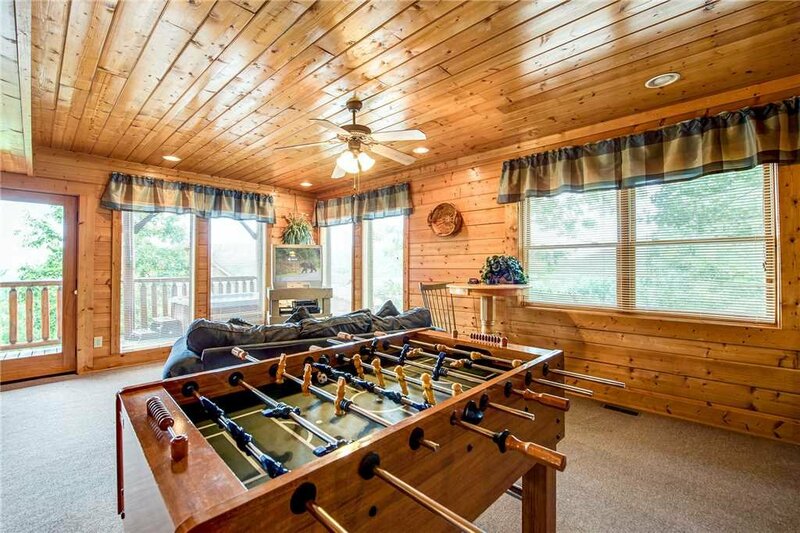 Book your stay today, and get ready to make fun-filled memories that will last a lifetime.